Two late goals gave Ballymena United a 3-1 victory over Warrenpoint Town in David Jeffrey’s first home game in charge. It looked to be heading towards a frustrating draw for the Sky Blues against a Warrenpoint side reduced to 10 men from the first half of the game. 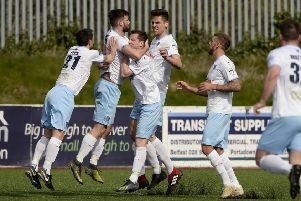 But substitute Willie Faulkner scored twice in the closing minutes to earn Ballymena three crucial points in their battle to escape from the relegation scrap at the foot of the Danske Bank Premiership. Jeffrey made just one enforced change from the side that drew against Crusaders in his opening match, with Nathan Hanley replacing the suspended David Cushley. The first chance of the game fell to Warrenpoint on six minutes as Stephen Murray’s pass found Conor McDonald inside the penalty area but Ballymena keeper Alan Blayney was quickly off his line to block the midfielder’s effort. At the other end, Darren Henderson’s back post header from Tony Kane’s inviting cross was brilliantly kept out by Warrenpoint keeper Jonathan Parr. Ballymena came close on 18 minutes when Gary Thompson dispossessed Warrenpoint left-back Mark Hughes deep inside his own half before slipping the ball to Allan Jenkins, but the Scot’s shot was deflected behind off Jordan Dane. From the resultant Nathan Hanley corner, Johnny Taylor’s powerful header was tipped onto the roof of the net by Parr. Instead, the opening goal went to the visitors two minutes later. Stephen Murray burst into the Ballymena penalty area and when his progress was held up, he laid the ball off for Johnny McMurray to neatly side-foot a measured shot into the bottom corner of the net. McMurray came close to doubling the border side’s lead on two occasions, five minutes before the break. Firstly his low angled shot was pushed behind at full stretch by Blayney and then shortly afterwards, the on-loan Cliftonville winger outmuscled Johnny Taylor before flashing a shot just over the angle of post and bar. But the game took a significant twist shortly before the interval. From a penalty box melee following a Tony Kane corner, Johnny Taylor’s goalbound header was palmed away by Stephen Moan who was subsequently red-carded for the third time in three meetings with Ballymena this season. Allan Jenkins’ poorly-struck spot kick was saved by Parr, diving to his right, but the Scot reacted quickest to knock home the rebound for his 11th goal of the season. Ballymena had a goal ruled out on 51 minutes as Jim Ervin, of all people, prodded the ball home from close range from a Darren Henderson knockdown but the effort was ruled out for offside. Warrenpoint came close on 58 minutes as, from a quickly-taken throw-in, Liam Bagnall made his way to the bye-line before cutting the ball back into the six yard box but Stephen Murray couldn’t get sufficient contact on his attempted flick to force the ball past Blayney. As Ballymena pushed for a second goal, Gary Thompson’s fierce volley was brilliantly tipped over by Parr but referee Raymond Crangle compounded the United midfielder’s misery by awarding a goals kick. And it should have been 2-1 to the home team on 63 minutes as Allan Jenkins’ teasing cross from the left was blazed wide at the back post by Darren Henderson at full stretch. The remainder of the second half turned into a turgid affair, littered with off-target efforts until United struck the decisive blow in the 89th minute. Substitute Jonny Frazer’s low shot bounced awkwardly in front of Parr who could only shovel the ball out as far as Faulkner who was on hand to steer a shot high into the roof of the net. And Faulkner completed the victory deep in stoppage time when he turned home a Frazer cross, just ahead of a defender. Ballymena United: Blayney, Ervin, Taylor, McVey, McBride, Thompson, Taggart (sub E Kane 79), T Kane, Hanley (sub Frazer 68), Jenkins, Henderson (sub Faulkner 86). Subs (not used): Nelson, McNally. Warrenpoint Town: Parr, Moan, McVeigh, Dane, M Hughes (sub Murphy 74), M Murray, Clarke, Bagnall, McDonald, S Murray, McMurray (sub Boyle 64). Subs (not used): S Hughes, McCabe, Graham.